In this class create a special wall hanging or a planter for your home or garden. Using an 8” diameter slab of clay, you have a choice: you can sculpt a sun and moon wall hanging or you can make a half-bowl style planter. You can decorate your planter any way you would like—I chose a flower motif. $59 for two classes for one adult to make one wall hanging. Part 1: April 26, 6:00-8:00+ pm. In this class we will design and build the project in wet clay. Part 2: May 3, 6:00-8:00+ pm. After the project has been bisque fired in the kiln, you return for a second class to glaze it. Class includes all supplies and firings. I’m going to glaze this one to look like the moon! In this class we will be using herbs as the imagery for clay platters, bowls or wall hangings. You will receive a 10" x 10" piece of clay which will allow you to make several pieces. We will use this process: Glaze is applied to wet clay in layers using sponges. Then press herbs, leaves and flowers into the clay in a collage-like manner. Continue overlapping plants and glaze until you are satisfied with the design. The clay is then placed into a mold to form it into a shape(s) of your choice. The result is a beautiful collage of herbs and color! This class is geared more for the adult but certainly kids 10+ can play too. $59 for two classes for one adult to make whatever they chose with 10 x 10” piece of clay! Part 1: Tuesday, May 14, 6:00-8:00+ pm. In this class we build the project in wet clay. Part 2: Tuesday, May 21, 6:00-8:00+ pm. After the project has been bisque fired in the kiln, you return for a second class to glaze it. Wall hanging clock with impressed tree bark motif. In this class create your very own ceramic clock! I will guide you through the basic clay slab construction and you can chose what kind of imagery and numbers you would like to add to suit your personal taste. In the second class you can chose how you want to glaze it and what colors you want to use. 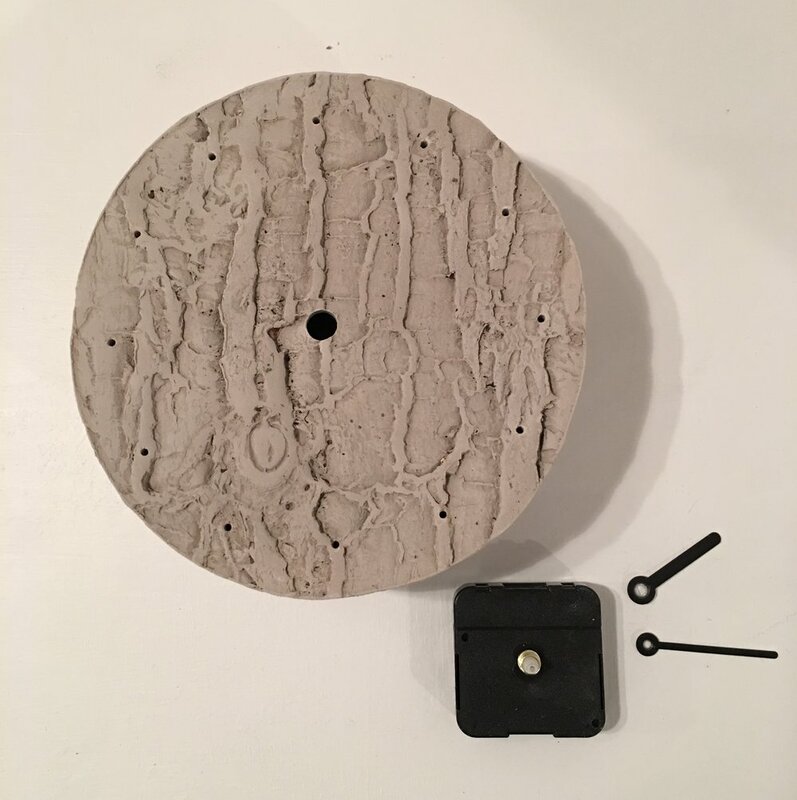 I decided to impress the surface of the clay with tree bark for the wall clock. After I glaze it, Im going to put little polymer clay mushrooms in the holes in place of clock-face numbers. For the desk top version, I could paint the clock face numbers with glaze or omit them all together! Let’s discuss what kind of clock you would like to make! Part 1: May 17, 6:00-8:00+ pm. In this class we build the project in wet clay. Part 2: May 24, 6:00-8:00+ pm. After the project has been bisque fired in the kiln, you return for a second class to glaze it.